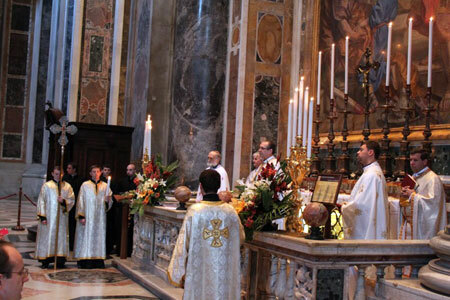 The Ukrainian society of Rome, on November 12, 2009, honored the memory of the Holy Martyr Saint Josaphat by celebrating a solemn Divine Liturgy on his tomb in the Basilica of Saint Peter in the Vatican. Representatives of Belarusian Greek Catholic Church also took part in the prayer. Fr. Vasyliy Kovbych, OSBM, Proto-archimandrite of the Basilian Order of Saint Josaphat, led the Divine Liturgy and gave the sermon. The mass was concelebrated with Archimandrite Syargiy Gaek, Apostolic Visitor of Greek Catholics of Belarus, rectors of the Ukrainian Pontifical Colleges in Rome, and over 30 priests. Representatives of all Ukrainian monastic communities of the Eternal City, seminarians, and laymen, joined in the general prayer. During the sermon Fr. Vasyliy recalled the history of relics of St. Josaphat, which for centuries encountered different dangers and even a certain period of neglect, and also persecution from the enemies of the church’s unity. Now they are set in the Vatican’s basilica, where they are a sign that unity of differences is possible. Describing the main virtues of the holy martyr – the readiness to regenerate, the readiness to sacrifice, and the willingness to make an effort for the sake of unity and for the endurance of good – the preacher remarked that the best way to honor and remember the saint is to emulate the mentioned virtues, in accordance with modern requirements and circumstances, and the necessities of the church. On Friday, November 6, 2009, the Reverend Bishop Dionisiy (Lyakhovych), Apostolic Visitor for the Ukrainian Greek Catholics in Italy and Spain, made a pastoral visit to the Ukrainian communities in Spain. The visit will continue to the end of the week. Along with visiting Ukrainian communities, the apostolic visitor will also conduct retreats and meetings with the clergy of the UGCC in Spain, which began on Monday, November 9 in the city of Seville. Today in Spain there are 15 priests ministering for the Ukrainian immigrants. The Lviv History of Religion Museum has accepted the exhibition “Transfiguration by the Lord’s love.” The opening of the exhibit will take place on Friday, November 6, 2009, at 12:00. Archbishop Ihor of Lviv, representatives of the regional Department for Execution of Punishment of the city and regional state administrations will take part in the opening of the exhibition of prisoner’s art. This exhibition, which is conducted under the patronage of the head of the Ukrainian Greek Catholic Church His Beatitude Lubomyr and organized with the assistance of the State Criminal-Executive Service of Ukraine, already prompted a number of positive reviews from the public when it was displayed in Kyiv, Donets’k, and Chernihiv. The majority of works took part in the national selection at the international competitions that took place this year in Vienna and Berlin. We already know the names of the winners of the competition “Signs of life” in Vienna: www.iccppc.org/ICCPPC_photo_ library/2009_art_gallery/ index.html. The announcement of the results of Berlin’s competition “By the eyes of others” is postponed by the Art and Prison Association until the end of November: artandprison.de/cms0/de/index. php?s=02&name=artcontest. What is most valuable for us is the possibility which is given to all visitors to write their own review to the author of the work which they liked. The purpose of the exhibition is to overcome alienation which arises naturally through imprisonment and to promote the process of renewing the social significance of people who had trouble with the law and were punished. It is important to widely acquaint the society with the modern criminal-executive service of Ukraine and with the service of the church for our fellow citizens who ended up behind bars. (20 October 09 –RV) The Vatican’s Congregation for the Doctrine of the Faith announced today that Pope Benedict has approved a special canonical structure called a personal ordinariate for groups of Anglicans who wish to convert to the Catholic Church. The new structure will allow converts, including their often married clergy, to enter into full communion with Rome, while preserving elements of their distinctive Anglican spiritual and liturgical patrimony. The announcement was made at a press conference here in the Vatican by the prefect of the CDF, Cardinal William Levada and simultaneously at a joint conference in London by the Archbishop of Westminster Vincent Nichols and the Archbishop of Canterbury Rowan Williams. 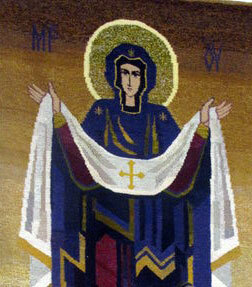 October 14 signifies the Feast of the Protective Veil or Sviato Pokrovy. On this date, Ukrainians all over the world gratefully and prayerfully accept protection from the Blessed Virgin Mary, and Her intercession on our behalf before the Lord. On this occasion we also pay tribute to the Ukrainian Kozaky, the warriors for freedom of UPA, as well as other heroes who fought for Ukraine's freedom. This year's Sviato Pokrovy in Munchen ( Germany) was organized on Sunday 11.10.09 by the Parafia in the church hall. There wаs a busload of guests from Ukraine, the Ternopilczyna region present. They had here a stopover on their way to Lourdes. To say “ thank you” o. Sviatoslav did present to the Bishop Petro Kryk a very nice icon of the Zarvanytsia Holy Mother to the Munchen Parafia.